We are living in difficult times with much fear, ignorance and violence in our world. All the more need, therefore, for Peace Mala - a multi award winning educational project for global citizenship and peace which began in Wales and whose head office is based in Morriston, Swansea. 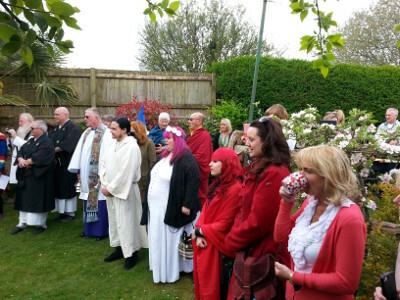 Peace Mala released 14 small symbolic doves made from wood painted in the Peace Mala colours and each carrying a Peace Mala bracelet (along with other items) during a ceremony that took place in our peace garden on 30th April 2015. For the ceremony we were joined by The Deputy Lord Mayor of the City and County of Swansea, the Mayor and Mayoress of Neath Port Talbot, Regional Chief of Police, Bishop Tom Burns of Menevia, representatives of several faith communities and pupils and teachers from some of our local Peace Mala Accredited schools. We were also joined by teachers and supporters from outside of Wales. As they travel we hope our symbolic doves will raise awareness of the work of Peace Mala with schools, youth groups and community groups wherever they travel to in the UK or in other parts of the world. Within the first few months after the launch, three of our doves travelled to the USA, Ireland, Holland, Italy, Cyprus, Israel, Africa, Hong Kong and Japan. The journeys of the 14 doves are being tracked to provide an exciting geography project for schools and youth groups. This information is already being published on Facebook, Twitter and our interactive world maps for everyone to follow. Each dove is being sponsored on its travels, thereby also bringing financial support and security for the future work of the Peace Mala educational charity. One of our doves, number 13, will be the Inter-Faith Dove of Peace. 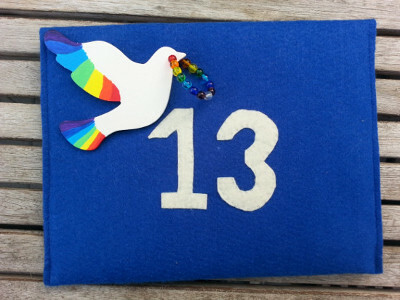 Peace dove 13 is travelling between the faith communities of our world to encourage friendship and better understanding. It will travel between the religious and faith communities of South Wales, starting with the Abrahamic faiths first. It will then travel to Manchester where the Naqshbandi Sufi Order of Islam will be the first to receive it before passing the dove on to other faith groups in the city. 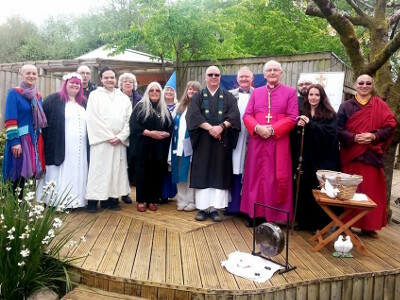 Each of the 14 symbolic peace doves is being passed on from sponsor to sponsor in the hope of generating financial support for the Peace Mala charity. Our idea is that as the 14 doves travel on their journeys, they will generate income that will make Peace Mala's work and future more secure. Doves may be sponsored by people becoming Friends of Peace Mala with Regular Giving Monthly or an Annual Donation. Another option is a one off Direct Donation to sponsor a dove. Please download the form for your particular choice of sponsorship from the following list and follow the instructions below. Whichever option sponsors choose, Peace Mala will be very grateful for the support. Our Supporting Peace Mala Online page shows you ways of supporting us both at home and from abroad and includes ways that are at no cost to yourself. Please contact our office if you wish to support this initiative and sponsor one of our doves. Let us know immediately that you wish to do this and send us a copy of your sponsorship form (choose which is appropriate for you from the accompanying list). We will then let you know which numbered dove you can expect to receive and who will be sending it to you. When the peace dove arrives, we ask that recipients let us know at once so that we can keep track of where the doves are and publish the information on Facebook, Twitter and our website. If schools, faith groups or organisations receive our doves, we would like them to have a whole school assembly or at least a meeting to raise awareness of the peace dove's arrival and the work and vision of Peace Mala. We hope they will also read out the Global Peace Prayer which will arrive with each dove. When sponsors/guardians have finished their journey with their dove we ask that they kindly return it to Peace Mala HQ in Wales so that another sponsor guardian can be found and the dove's journey can continue. May our 14 symbolic doves of peace travel far and wide and share the Peace Mala message and vision for a more compassionate world. Thank you so much for your support of our work with schools and the wider community.